Just how concrete went from mainstay of a Soviet brutalist architecture to darling of the high end design world, is a matter for another story. However, let’s just agree for the sake of this story that the unassuming utilitarian material is having a serious homewares moment. Like, it’s everywhere. And although concrete doesn’t immediately jump out as the lustiest of homewares fodder – thanks to its somewhat unsexy original purpose – some creative cookie has taken cement from drab to fab. And we are très grateful. 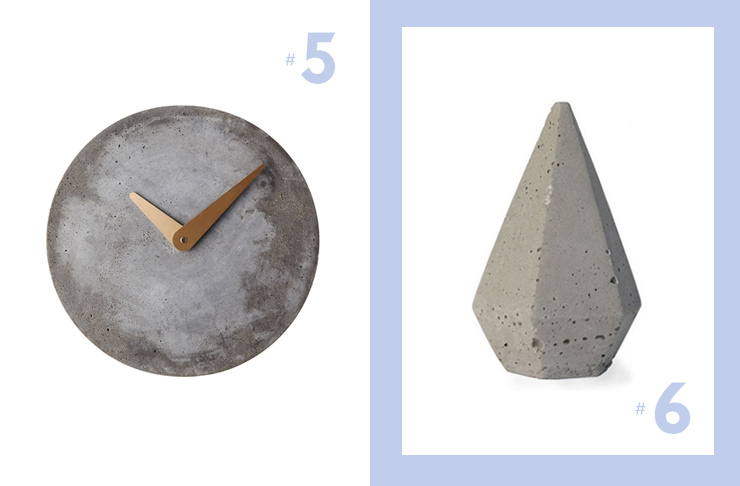 Because it’s not all sidewalks and buildings, here’s a slick round-up of our fave concrete homewares. 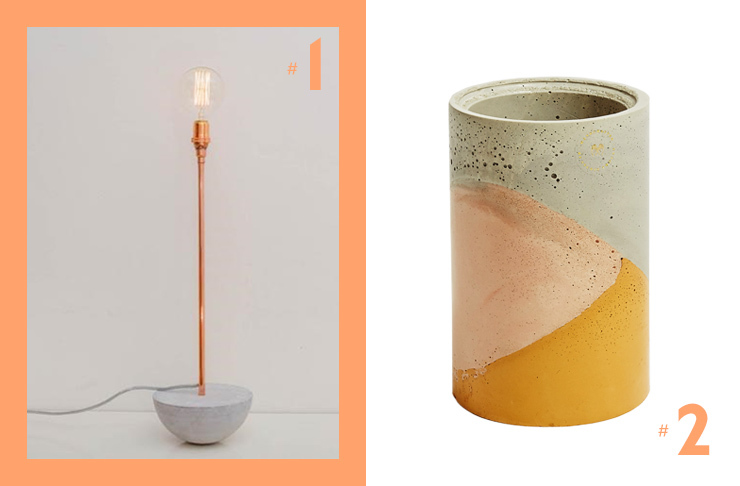 With a touch of copper (another on point trend, btw) and a smooth rounded base, this novel rocking desk lamp is a concrete lighting masterpiece. The punnily named number from Workshopped is even klutz proof, so you can talk as animatedly as you like without fear of smashing a the bulb. Find it at Workshopped, online or visit the showroom at 755-759 Botany Rd, Rosebery, NSW. 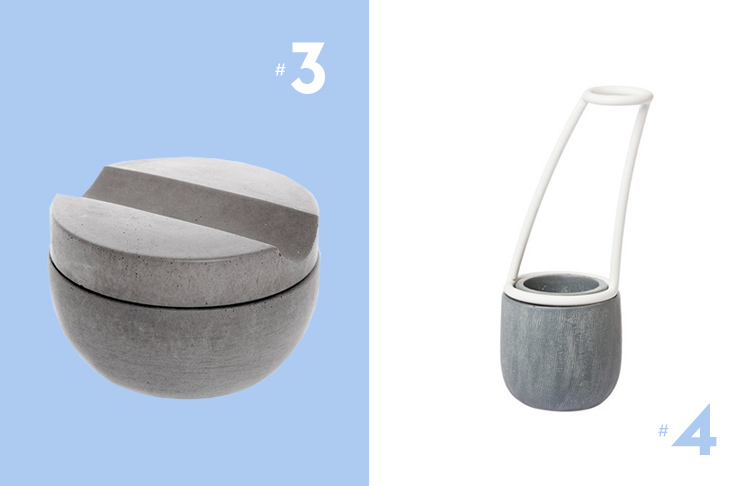 These nifty Studio Twocan vessels from Monk House Design are like an intro to concrete homewares enthusiasm; not too grey or stark and perfectly usable. Handcrafted in Melbourne, the cement ceramic is designed in muted earthen tones to mimic the Australian landscape. Find them at Monk House Design, online, or visit them in store at 102 Lygon Street, Brunswick East, Vic. Unashamedly Scandinavian in its simplicity, the Iris Hantverks shaving set makes shaving less of a chore. With an inset groove to hold the separately sold brush and a sandalwood scented glycerin soap in the bowl, it’s perfect as a gift for your boyf, or Father’s Day. Find it at The Foxes Den, online or visit them in store at 78 Mackelvie St, Ponsonby, Auckland. There’s nothing like a single long-stemmed flower or striking native botanical perched nonchalantly in a vase to signal your interiors cred to the world. Nail it every time with the Zakkia Ghost Concrete vase made with a waterproof base, and magnetized wire frame for extra support. Available online at Victorian retailer Crate & Co.
What’s the time? It’s time to get yourself the Churchill Clock from Melbourne design hub, Hunting for George. The gold metallic hands contrast well against the textured dark grey concrete base, a standout feature on any wall. Get it online at Hunting For George. Concrete diamonds may not sparkle as much as their jewel counterparts but they certainly make for effective decorations. The Zakkia concrete diamond comes in large and can be used as a paperweight for all your important documents, or as an addition to a monochrome vignette. Find it at Simple Form, online or visit them in store at 95 Charles Street, Seddon, Victoria. 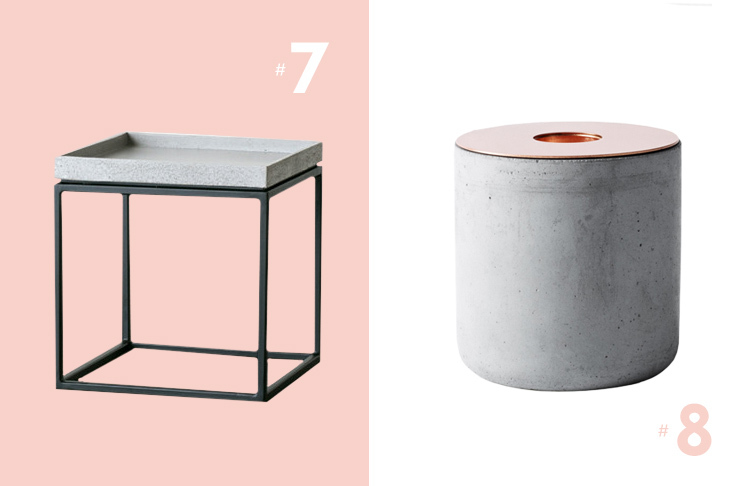 It may feel retro to use an actual candlestick thanks to the popularity of poured candles but once you get your mitts on this concrete bad boy by Danish design house Menu, there’s no turning back. The copper top adds just the right amount of shimmer to this weighty candleholder. What do you get when you pair a cement tray with four legs? A practical side table with a dash of minimalist elegance and a whole bunch of functionality, that’s what. Available in both tray top and flat, they can be clustered together to form a cool deconstructed coffee table, or next to the couch or bed. Available from The Minimalist online with free delivery or pick up from Surry Hills.